A team photo inherited by Ken Clavette when he purchased a house from the widow of the team “Rover”, Ross Merritt. 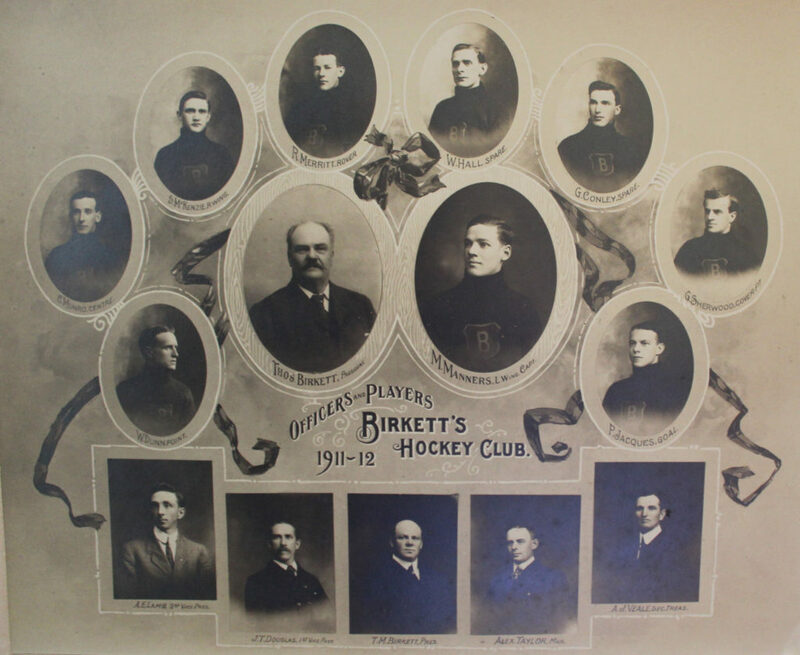 It is not uncommon for local businesses to sponsor sports teams but Rideau Street Hardware merchant Thomas Birkett (Feb 1, 1844 – Dec 2, 1920) took this to a higher level when he assembled a winning hockey team in 1911-12. The team, named for him, was also an all-out effort of his business. Of the nine teenage players five were employed directly by Thomas Birkett & Son, as were all the team’s five managers. Four of the players lived in Sandy Hill: Gardiner Conly lived on Cobourg Street; Percy Jacques and Ross Merritt on Henderson Avenue; and their captain Maynard Manners lived on King Edward Avenue—a bit of a community effort to make Sandy Hillers proud. Birkett was a fixture in Ottawa, at the age of 13 he became an apprentice to a local hardware store opening his own in 1866. Active in local politics he served on the school board (1867-1871), was an Alderman on City Council (1873-1878), Mayor in 1891, and Member of Parliament (1900-1904). His grand home, now the Embassy of Hungary, on Metcalfe Street is known as Birkett’s Castle.